On October 17th this year, we see the imperfect but troublesome alignment of a series of planets bound to cause some earthquakes on Earth. 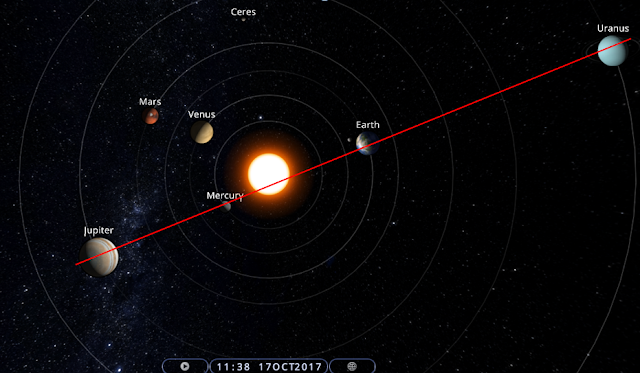 We see from the figure below Jupiter -Mercury-Sun-Earth and Uranus to try to align. The imperfect alignment means we may see increased activity before or after this date. We hope to have more on this in due course. Be Safe be Good! EP. Thanks for this. Good to see you back. Just checking, as no emails have been coming through despite being registered? Value your information greatly. October 17 has been identified as having ominous portents. It is interesting that you have confirmed it too. it will last only for a day or a period? how long?